I am feeling very helpless now...It is an on and off relationship with Aaron and I will be flying to Perth this coming Friday to mend and fix things between us a bit, do not know if it is for the better or for worst. Aaron is second. Right now...I am feeling helpless and weak and sick and useless because I am diagnosed with Shingles....It is basically getting chicken pox the second time. It is also Sue's birthday today and I did not make anything to celebrate the occasion though I am indeed miles away from her and the family. It started with a very high fever and the doctor did said any higher would probably have cause me some good damage on the brain, phew...Right now, I need to be isolated, all by myself in the vicinity of my room and bear the pain on the muscles and joints for 3- days and the later 3-4 days would be just drying the scabs off and hopefully leaving no pockmarks. Then I remember I heard of LiveSTRONG event and 'A Taste of Yellow' from Shirley's blog post and how it coincides with my sister's birthday....Global LiveSTRONG events are everywhere and are participated by millions, even in Adelaide, where a group of people would clad on yellow shirt and cycle all along the beach in conjunction with the day while I pathetically stayed at home. My Nonna was diagnosed with cancer but it was nothing serious, but still, a cancer is a cancer and has its risk. She underwent chemo once and was much better. It came back once again and she went for another round of chemo and that was about it. At her age, she is definitely very strong and to live till today and raised half a dozen of children all by herself, she is the heroin in all our hearts. My oldest aunt, diagnosed with cancer too...Nonna's on the neck and Aunt's one's on the nose. She lost so much weight and massive hair loss were observed throughout the chemotherapy period, with occasional vomiting. It would break anyone's heart to see what she's been through...I believe everyone could be and need to be strong, at some stage in their life, when they are facing life-death situation. My Shingles, it is nothing compared to what cancer patients would have to go through or have been through, I should stop complaining and live with it. I know this is a food blog but look, I am 25 so gimme a break and lemme say naughty sometimes...And hopefully I will come back with more good news in the following post. I've been cooking a bit and making things in the tiny little kitchen, they are all up on Facebook and hopefully will be up soon. Right now, I really got to go, it took me 90minutes to write this, can you imagine??? 21 comments on "A Taste of Yellow: Perfect Scrambled Eggs"
This must be a tough time for u. Stay strong, eat well and get well soon! Keep eating well, have plenty of rest and do light easy things to keep your mind occupied. Hope you will be well soon! Quinn thank you. I'm happy to have your entry. My Mum has shingles so I know how tough it is. Hope you feel better soon. I cook my scrambled eggs just like Gordon, have been for years. I have them at least once a week. Usually on Sunday night for dinner. Hope you feel better! Shingles is no fun! I had it when I was 10. It hurts and it itches. This is a perfectly cook scramble egg indeed! Nice colored! There no doubt a great breakfast to go with a piece of toast! 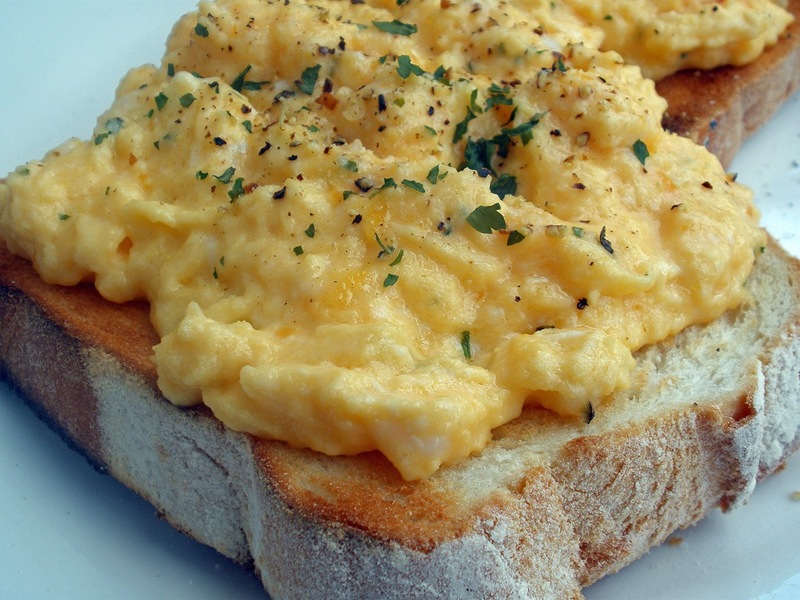 Your scrambled egg toast is done perfectly! Looking at the runny eggs is enough to make me hungry. Quinn, take care and speed recovery! Quinn, your scrambled eggs look very soft and yummy! Really love to have this for tomorrow's breakfast. Hi Quinn, you have to take care of yourself first. Get better before you tackle anything else. I too am going through a difficult time right now as I have recently lost my husband. But I'm keeping myself occupied as much as possible - otherwise I would probably drown in my own sorrow. You have to stay strong for yourself. oh dear, sorry to hear you have Shingles >.< Rest well and I wish you a speedy recovery. The eggs looks marvellous. I did a LiveSTRONG post too! Thanks so Shirley and Ellie. Sorry you're not well Quinn. Rest up and hydrate well k? Your readers miss you! Quinn...take care and stay strong. Rest more and don't have to feel isolated. We are with you here. The scrambled eggs looks delish! Eat well and rest more. Hi Quinn, I think when I first saw your entry, I was still in Sydney. Hope you are feeling better and I am glad you've managed to make it for this entry despite your illness. Hope you will work things out in Perth too... Remember what I've told you- at your age, you should be carefree and enjoying youth! Hope you are feeling much better and looking forward to your Perth trip. If you are craving for some Nyonya food, drop into Bibik Chan's at Sterling Highway. Here, we share similar stories. I started out mine as absolutely a food blog. Somehow over the year, it's evolved into a blog on which I ramble about foods and life. So with that said, this is your journal. Just write what pleases you here. Don't worry what others think about it! This is Quinn! Everything is so Quinn! OK? I'll be here patiently awaiting good news from you. You guys have come a long way. I still have faith in you. Now, 25 is young, OK? I'm 2 years younger than you're. So, what am I? LOL! AND, taking 90 minutes to write is considered short. I take a few days to complete, from composing to editing. You haven't beaten me in that sense. oh dear, hope all is well with you. get well soon ya and do take care. Oh yes! Totally awesome and definitely the perfect scrambled eggs! Love it!